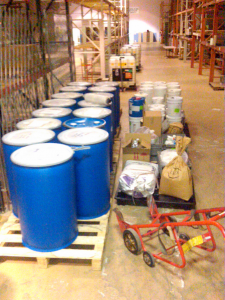 Does your organization have chemicals on the premises? Do you know how to safely handle them? Has your team been through chemical safety training? Do they understand SDS’s and the information on them? Employees can be exposed to chemicals at the Cultivation, Production, or Manufacturing facility. There is misinformation, preconceived assumptions or out right negligence with regards to chemical hazards in the work place. There is also due diligence, accountability, and adherence to industry regulations. Getting EVERYBODY on the same page across the board goes a long way to ensure we are working safely and committed to workplace excellence. Would you like to understand the risks and how to protect your self and your team from chemical inhalation, spills, burns, and exposure? What, in your opinion, is the most significant chemical hazard(s) in your workplace? Let us know in the webinar! Join us as we learn from John Darius Soltes, CHMM, as he leads us through a safety protocol at work. He’ll be able to answer YOUR questions. REGISTER HERE for the FREE Webinar on Nov. 7th. Next PostAppreciation ~ Thank you, Gail! Thanks for sharing the safety protocols when handling cannabis using chemicals. It is really helpful for small time business owners and investors. We must be accountable for out actions! Thanks for your comments, Jim. We appreciate people having the integrity to follow compliance. Hi! Yes, I would love to please! Appreciate this information… a step forward in the right direction for grower education. There’s a lot of mishandling of many dangerous chemicals in the cannabis growing community. Particularly frustrating is the growers who spray buds with various fungicides before harvest.